I wrote the following for my Anatomy and Physiology II class. My research sources were the video Sickle Cell Safari, Wikipedia (groan), the class lecture notes, and my text, Anatomy and Physiology. I am posting this because I thought that it might be interesting to others. Also, there is a connection to be made between the previous dispatch (entitled “Nosebleed”) and this one; in that learning occurs when we make seemingly tangential connections. Dr. Anthony Clifford Allison (1925-2014) first surmised and then proved that there was a correlation between sickle cell anemia and malaria, the correlation being that individuals with one copy of the gene, which is the sickle cell trait, are more likely than those with two copies of the gene, to survive malaria. Paraphrased from our text – Human Anatomy and Physiology –the “havoc” caused by the abnormal hemoglobin (hemoglobin S HbS) is caused by a change in one of the 146 amino acid chains in a beta chain of the globin molecule. This alteration causes the beta chains to link together under low oxygen conditions, forming stiff rods, making the hemoglobin S spiky and sharp. The red blood cells then become crescent-shaped (hence the term sickle cell) when they unload oxygen molecules or when the oxygen content of the blood is lower than normal. The deformed erythrocytes rupture and dam up in small blood vessels, interfering with oxygen delivery. This here is the very important physiological connection -- sickling reduces the malaria parasite’s ability to survive and enhances macrophages’ ability to destroy infected RBCs and the parasites they contain. This here is the physiological connection. The enormity of Allison’s discovery is, of course, important in relation to medical science. However, as equally important is the fact that Allison’s findings are to a large part reflective of his upbringing in Africa, his degree of intellectual curiosity, his broad-based academic training, and his ability to make seemingly tangential connections. Allison was born in East London, Eastern Cape, South Africa. He spent most of childhood in Mawingo in upper Gilgil, Kenya, overlooking the Great Rift Valley. Early on, Allison developed an interest in human evolution. Growing up in Kenya, he made close contact with several paleoanthropologists, including Lois Leakey. As a teenager, he was strongly influenced by Charles Darwin’s On the Origin of Species and The Descent of Man. He attended boarding school and then returned to South Africa for higher education, where he obtained his BSc in Medical Science at the University of the Wiwatersrand in Johannesburg. One of his Wiwatersrand teachers was Raymond Dart, the discoverer of an extinct hominid Australopithecus africanus. Allison entered Merton College, Oxford in 1947, and there he earned his Ph.D. with an emphasis in medicine. While a graduate student at Oxford, Allison joined a vocational Oxford University Expedition to Mount Kenya in 1949. That year he participated in a vocational Oxford University Expedition to Mount Kenya where he collected blood samples from Kenyans for analyses of blood groups and genetic markers for sickle cell disease. At the time, the question that scientists were asking was, why did this disease kill people before they reached puberty, which is before they themselves were able to pass on the lethal gene? What Allison discovered was that the prevalence of sickle-cell trait, that is the heterozygous condition, among coastal inhabitants was higher than 20%. (At the time the highest record was 8% among African-Americans.) The more specific question that Allison considered was why such a deadly disease (in homozygous condition) would be more prevalent in a localized area in the form of a less lethal heterozygous form. He formulated a hypothesis that it was because it had a selective advantage towards malaria. Because the region was malaria endemic, acquiring a genetic mutation, but not the lethal form, could confer resistance to malaria. Allison had to wait four years until he completed his medical coursework before he again addressed this question. He returned to Nairobi in 1953 and started his experiments. He selected volunteers (the Luo people) who came from malaria hyperendemic area around Lake Victoria. Experimental infection in volunteers indicated partial resistance to malaria. Allison then found children naturally infected with malaria in Buganda. He discovered that children with heterozygous trait had significantly low number of parasites in their blood. This further implied that heterozygosity in children was connected with a better survival rate against malaria. 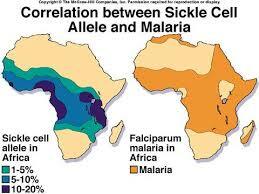 Allison’s final results (which were reported in 1954 and gathered from nearly 5,000 East Africans) indicated that sickle-cell trait confers resistance to malaria. Allison’s genetic theory of malaria resistance, was initially received with skepticism. This was because malaria was equally found among homozygote and heterozygote patients in some East Africans. His arguments were proved right by subsequent studies among children of East, Central, and West Africa, showing 90% protection from malaria among children with heterozygous allele. In 1982, Allison and Eugui reported in the Christmas issue of The Lancet the discovery of immunity to malarial parasite Plasmodium falciparum by the production of free oxygen radicals in the immune system. A quick response came from Ian Clark (former Ph.D. student of Allison), W.B. Cowden, and G.A. Butcher, both of the University of Newcastle Medical School in New South Wales, who claimed that the scientific ideas were originally theirs, and accused Allison of stealing the idea. Clark further stated that he had developed the concept way back in the spring of 1982, and submitted his report to Nature, which rejected it. It was eventually published in January issue of Infection and Immunity. In August 1982, Clark had given Allison a draft copy of his manuscript, then Allison's own experimental result was published in December. Reacting to the accusation, Allison explained that his experiment was independent of Clark's, and returned the accusation that while he was his student, Clark had claimed two works as his own, which were not. But in this case, it was generally agreed that the original idea was Clark's. A reconciliation paper was published in February 1983 jointly written by all the scientists involved. Goodness. I don’t know what to say about this.